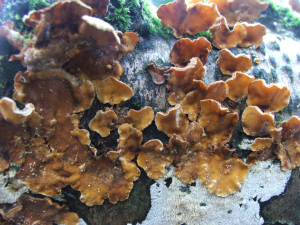 Observation - Hairy Curtain Crust (Stereum hirsutum) - UK and Ireland. Description: very hairy on upper surface. growing on a fallen birch (betula) trunk. very hairy on upper surface. growing on a fallen birch (betula) trunk.